is not about Funeral Arrangements. for a deeper sense of peace, joy and harmony. It's about hearing the unsaid, articulating it, processing, planning, organizing, and communicating in a positive, direct way with empathy. End-Of-Life Planning is about shaping so much for current and future generations. I'm a Board Certified Professional Organizer and End-of-Life Planning Advisor, and I hold specialist certificates in both residential organizing and workplace productivity. I help individuals and families get their documents and planning in order. My proven talent, great joy and calling is supporting those facing grief, loss, and the complications associated with aging, including Alzheimer’s disease, and dementia. My mission is to empower you to make conscious choices about your life, loved ones and belongings. I offer customized consultations or support, one-on-one programs, workshops, and talks to support these specialty areas. I've lead training workshops across the U.S. and Asia, am currently President Emeritus of the San Francisco chapter of the National Association of Professional Organizers (NAPO-SFBA). I am also an active leader in my faith, community and profession. And I'm ready to help you to begin to organize and get through significant life transitions including illness, a loved one’s death, and difficult lifestyle changes. My clients call my combination of endless energy, attention to detail, honesty, humor and compassion a “breath of fresh air.” Let me help you navigate sensitive conversations, make tough decisions and get unstuck in a way that brings joy, harmony, and a deep sense of peace to your life and those closest to you. Schedule a free complimentary consultation or check out the other ways to get guidance by exploring the options below. Curious To Know What Inspired Me To This Life Path? and for people around you. It might feel like you are on your own. You know you don’t want to experience a crisis like ones you’ve seen with your family and friends. You might dread going through all of the decisions and paperwork for your finances, healthcare and legal matters. But you know you want to make it easier for yourself and your family. Perhaps you’ve got life insurance, or a retirement account or a will or even a trust that hasn’t been updated in years. Maybe you have told your children the things you want them to have at the end of your life. But if you’ve had to take care of an ill parent or have had a loved one pass away, you know that these things don’t even scratch the surface of the decisions required to give you peace of mind that everything and everyone will be taken care of. You don't have your affairs in order. Any one thing, like falling, or an accident could happen. If you have kids, don't assume they will step in. Generations are very different. I’ve talked with many people where their kids have never even asked if they can help. They don’t realize how frightening it can be for you. A few have told me that they could be dead for days and no one would know. will anyone really know what you want? Will they know what is expected of them? Or where the paperwork is? Will they know where to start? Will they know what your wishes are? Will they even have the power to make decisions? Whether you have children or not, it gets complicated. And if you’ve got a patchwork blended family, there might be kids and step children who may or may not be in agreement on what the family has set up in the past - some might even challenge the trust or will. The details of getting your end-of-life plans organized can feel daunting and it can be intimidating to know who to trust. Plus the kind of decisions and options to think through can be an emotional or triggering experience. Put your mind at ease by finally getting your end-of-life plans organized. If you are feeling in the dark about where to start, I can help you. I provide honest, judgement-free guidance and support so you can figure out what’s best for you and communicate your wishes to those you love. Your friends, family and legacy will be protected. Let's map out the best next steps for getting your end-of-life plan organized. What If you Are caring for someone else? You might be going through emotional grief of the diagnosis of someone you care about and be unable to process. It can feel predatory to have "the talk" with your parents. You might be afraid of bringing it up while at the same time have fear of getting blindsided. You might be going through incredible emotional grief without knowing where to begin. Maybe there's stress and resentment towards your siblings lack of involvement. Or a hope that someone else in the family will take over. What if the trust was made at a challenging time - like early stages of Alzheimers, or just after divorce, or immediately after the death of a loved one, when perhaps they weren’t thinking clearly? You do not have to approach this alone, this is my specialty, and I'd love to support you. Let's start with a complimentary consultation so I can get a full understanding of all the moving parts you are having to juggle and areas that you are in need of some guidance. "I lacked the courage necessary to have sometimes difficult and awkward end of life planning discussions with my step-father and mother, my father, whom I am slightly estranged from, and my husband. Working with Audrey helped me to explore my feelings about taking on responsibilities that I had some resentment about. She allowed me to vent my frustration and anger and gave me ideas of how to deal with that. I found the courage to have those difficult and awkward discussions with my step-father and mother, my estranged father, and husband. It brings me great peace, satisfaction and sense of completion to know that I have left in place a plan with important documents for my wishes to be carried out that will allow my loved ones to avoid probate, help me make decisions for them on their behalf, and for me, on my behalf should I become unable to do so. Without Audrey’s encouragement and inspiration I would not have tackled this beast!" "When I found out my Mom was terminally ill, I felt overwhelmed. I am a professional organizer by trade and feel very capable of structuring projects and putting things in order. 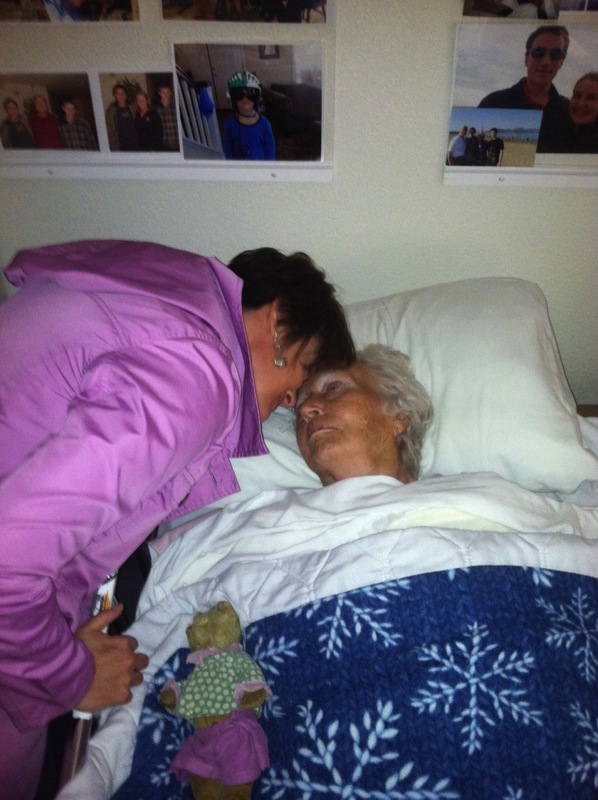 There is just so much to navigate from understanding hospice to navigating family dynamics. Audrey gently guided me through the whole process and helped me prioritize, process and answer my many questions. She is a wealth of knowledge, a good listener and someone you would be smart to have by your side if you are caring for someone terminally ill. With her support, I was able to focus on what really mattered and that was being present for my Mom. Thank you Audrey for being that calm presence in the storm." "In working with Audrey I have put together my 'End-of-Life' wishes. It includes details of what kind of memorial service I would like down to the music and clothes, plus I have specific instructions for who will be executing which specific task to minimize stress for my loved ones. Audrey pointed me in directions, I would not have been able to talk about with my family or even realized needed to be addressed. Thank you Audrey for your expertise, patience, guidance and support. I have peace of mind now that my desires for my “End-of-Life” wishes will be carried out the way I would like them to be. That really is a wonderful feeling and a huge relief that I don’t have to worry about it anymore. I am profoundly grateful."